wkhtmltopdf has a bug as a result of a webkit bug. This means that the nice css styles for table printing don’t work in wkhtmltopdf. //how many pages of rows have we got? I have a particular Linux set up I need to test something on, but I use a Mac, so I use VirtualBox with a Linux VM for the testing. Neither of these options are really that great, so a friend recommended I mount the code folder from the Mac on the Linux VM. Great idea. So I install a new copy of CentOS and keep it minimal, no window managers, nothing like that. Just Apache, and the database connectors I require. Now, I would not class myself as a Linux expert in any shape or form. I can set up a server and manage it, ut if you delve too deeply, I start to struggle. I used the VirtualBox automatic mounting for my code folder (using Guest Additions) – this just would not work. I tried checking out the code into a local folder and that worked fine. Must be a problem with the share/permissions or something. After wasting an hour or so checking permissions and groups, I gave up and tried the internet. Came across a really helpful post, which I sort of followed. I had to alter it for CentOS as it was Ubuntu orientated. You have to install Guest Additions first! 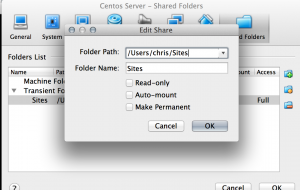 Create a Transient folder in the shared folders section and take note of the name, I used ‘sites’ – do not select any of the checkboxes when creating the share. This is what causes the problem as VirtualBox creates the share with permissions that Apache cannot use. Hey presto, the folder is mounted on boot and you should be able to serve the docs from there. Obviously you need to update the vhosts to point at the shared folder. But you know how to do that, right? I found that a script I was running was calling some linux functions using exec() but they weren’t always successful and I couldn’t tell why. I recently wanted to add a Zend library to a project without adding the entire framework. I found that internally, the Zend application requires the Library path to be in the include, as it uses relative includes. So, easy to fix without editing the actual pages. I just needed to add the folder they were in, to the PHP include path. You cannot strip a certain list of tags with PHP’s strip_tags() function, you can only strip ‘all but’ tags. This error /can/ be missleading. I thought something was up with the stream (guessing there was a misconfiguration with PHP, IMAP and openSSL) – but it turned out I had typed the wrong password in the initial request. Just incase anyone else is struggling here, just check that first. Then, ensure you have installed the openSSL and the php5-imap extension correctly. It should refresh most of the settings. Helpful to know. If you are switching on the AllowEncodedSlashes setting in the apache conf file, and it doesn’t seem to be making any difference, then it may well be because you are using vhosts, and the setting is not automatically propergated through them. Be sure to read all about it, and understand the security risks.